According to the global press freedom watchdog's Annual Prison Census, 251 journalists are currently in jails around the world as of Dec. 1 for charges related to their work -- 68 in Turkey, 47 in China and 25 in Egypt, collectively responsible for more than half of the journalists behind bars. Turkish President Recep Tayyip Erdogan has been one of the harshest critics of Saudi Arabia's Crown Prince Mohammed bin Salman for his alleged role in Khassogi's killing, but following a failed coup against his government in 2016, experts said, Erdogan has engaged in a country-wide crackdown on criticism. 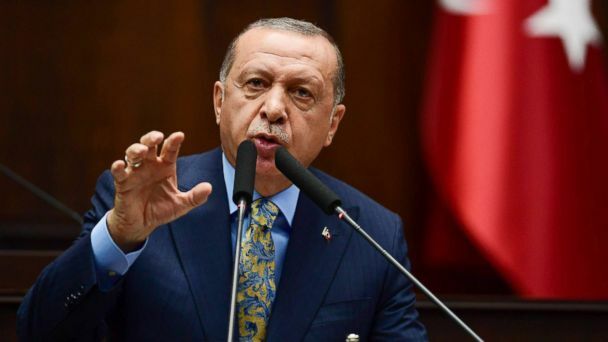 "Turkey has really cracked down on the independent press by equating journalism with terrorism," Courtney Radsch, advocacy director for the Committee to Protect Journalists, told ABC News. "And we see this as part of a pattern that's been in place for many years." Criticism of Saudi Arabia's record on press freedom is often warranted. Khashoggi's murder, which provoked outrage around the world and even spurred Time magazine to name him and other persecuted journalists the magazine's "Person of the Year," comes amid a spike in the country's own repression of journalists. Whereas CPJ found at least seven journalists in jail in December 2017, that number has risen to 16 just a year later, including four female journalists who covered women's rights in the country. And with President Donald Trump's popularization of the pejorative term "fake news" to describe and denounce critical coverage of his administration, the CPJ recorded a significant uptick in the number of journalists facing "false news" charges around the world since his election. In 2016, only nine journalists around the world were held for that charge. After Trump's election, that number rose to 21 in 2017. And it rose again to 28 in 2018. "We see countries are using the same terminology and pointing to the United States and pointing to Trump's labeling of journalists as fake news," Radsch said. "It basically serves to inoculate those in power [because] it creates distrust." "We used to think that when journalists were under attack, at least you would have the largest pulpit of them all, the U.S. president. But it's the opposite," Cook said. "The press has been labeled the enemy of the people and that's been heard around the world by people who think likewise."